Excellence, one of Western's foundational values, is demonstrated every day at the College. Establishment of the Performance Excellence Framework as the College's organizational blueprint, along with the other college values, is an important step in achieving the College's Vision 2020. 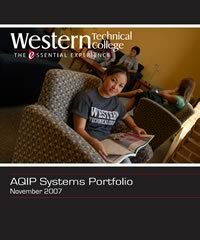 In September 2000, Western was selected as one of 13 charter organizations to participate in an alternative accreditation process called AQIP (Academic Quality Improvement Program). AQIP was designed to align accreditation with an organization's performance excellence efforts, and it is a component of the Higher Learning Commission of the North Central Association (NCA). In July 2011, Western was one of the first colleges to pioneer a Baldrige-based Systems Appraisal as a key component of the AQIP accreditation process. Submitted to the Wisconsin Center for Performance Excellence as part of the Wisconsin Forward Award Application process, the Systems Appraisal describes Western's commitment to excellence in its leadership; planning; students and stakeholders; workforce; operations; and measurement, analysis, and knowledge management systems. Western Technical College is one of 16 Wisconsin technical colleges that make up the Wisconsin Technical College System. Western is accredited by The Higher Learning Commission. Western is also a member of the American Association of Community Colleges, the American Technical Education Association, and the American Vocational Association. Western is a member of the National Council for State Authorization Reciprocity Agreements (SARA) initiative, which makes academic programs available to students outside of Wisconsin. Visit www.nc-sara.org to learn more.